Free! For a limited time, NEVER TOO LATE is FREE! Yes, it's true! 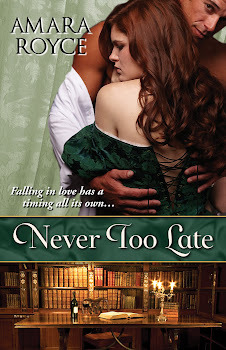 Never Too Late is currently FREE for Barnes and Noble's Nook and Amazon's Kindle! Yes, free! I think it's also free on iBooks but can't link to it. Oh, you don't have a Kindle or Nook? Don't fret! There are apps for those! I know the Nook freebie deal is running until April 29, but I don't know when the Kindle deal ends. Oh, and *cough* watch for Barnes and Noble's Free Fridays feature on April 25! psst--Right now, right this minute, Never Too Late is #1 on Amazon's list of Best Sellers for Historical Romance (in the Top 100 free category for Kindle historical romances) and #38 on Amazon's list of Best Sellers in the Kindle Store (in the Top 100 free category). Squeeeeeee! Fleeting, I'm sure, and in rather specific subcategories, but it's pretty darn cool to see it listed as #1 somewhere! Squeeeeeeee again! THANK YOU to everyone purchasing it! I appreciate each and every review, whether it's positive or negative or anywhere in between. I appreciate everyone who takes the time to try my books. No matter what your response to my books ends up being, I appreciate that you gave them a chance. I don't expect everyone will love my work; fiction is far too subjective for that. Do I want people to be enthralled by my books? Well, of course. Do I want people to say to others, "You've GOT to read this!" Absolutely. But I fully understand that this is a dream scenario, and I know that you, dear readers and reviewers, don't owe me anything. So thank you in advance if you read ALWAYS A STRANGER. With all the millions of books out there you could choose, thanks for giving your time and attention to mine.